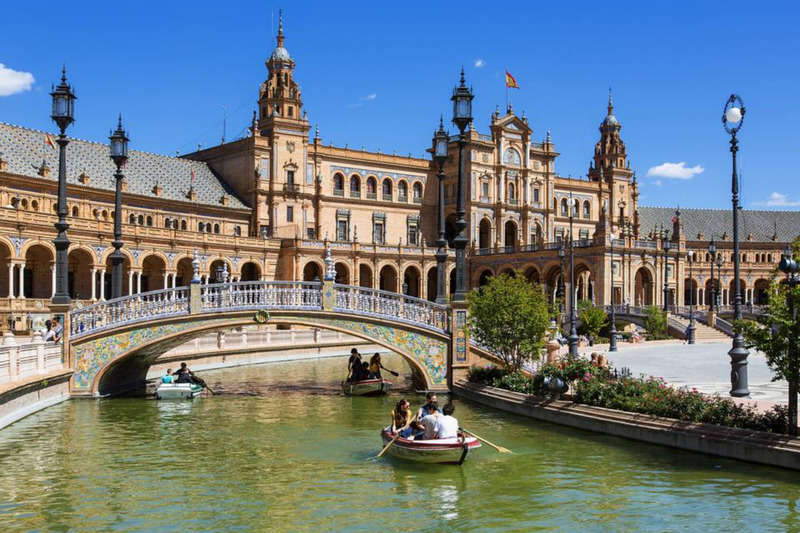 As the capital of Andalucia, Seville has a wealth of history, culture and gastronomy to offer. From Roman and Moorish delights to contemporary architecture and interactive museums, you'll have plenty to keep you busy on your visit to La Hispalense. 1) La GiraldaThe Giralda is the only remaining structure of the 12th-century mosque torn down during the construction of the Seville Cathedral. Moors built the minaret with a series of ramps so that guards could ride to the top on horseback. Today, the 35 ramps make it easy for visitors to ascend to the summit to enjoy panoramic views of the city below. The bell tower is capped with a bronze weathervane called El Giraldillo, which is a symbol that represents the triumph of faith. The entrance to the tower is located in the cathedral’s northeastern corner. Still used today by Spain’s Royal family on state occasions, the Alcazar complex of royal palaces, patios and gardens has undergone many transformations over its more than one-thousand-year history. In the 11th century, Muslim Moors constructed a palace on the site of a 10th-century fort, which was converted to a Gothic-style structure in the 13th century. One hundred years later, King Pedro hired Moorish craftsmen to rebuild and expand the palace in the Mudéjar style. From the starry design of the domed ceiling in the Salón de Embajadores (Ambassadors’ Hall) to the delicate arches and plasterwork of the Patio de las Doncellas (Patio of Maidens), the Palacio de Don Pedro is considered one of the top tourist attractions in Seville. Built on the site of a grand Almohad Mosque, Seville’s medieval cathedral was built to demonstrate Seville’s power and wealth after the Reconquista. At the time of its completion in the 16th century, it supplanted the Hagia Sophia as the largest cathedral in the world. It is still the third-largest church in Europe, and the biggest by volume. The mammoth Gothic structure features an altarpiece depicting the life of Jesus that includes more than 1,000 figures covered in gold leaf. The cathedral’s artistic treasures include Pedro de Campaña’s Descent from the Cross, Francisco de Zurbarán’s Santa Teresa and Bartolomé Esteban Murillo’s masterpiece, La Inmaculada. Within the church’s transept lies the tomb of Christopher Columbus. No other structure in Seville better explains the role that the Guadalquivir River played during Spain’s colonial period than Torre del Oro, the Golden Tower. Seville owed much of its success in maritime trade to the navigable river, which offered ships more protection than a traditional European port. For centuries, a heavy chain was strung across the river from the tower to protect the city from seafaring invaders. Built in the early 1200s, the watchtower’s name comes from the golden glow that the reflection of its building materials casts on the river. Today, the tower is home to a maritime museum that outlines the river’s importance throughout Seville’s history. Visitors can enjoy views of waterway and city from a rooftop viewing platform. Located to the east of the Old City, the Barrio Santa Cruz is bordered by the Guadalquivir River. The neighborhood was Seville’s Jewish quarter until the late 1300s, when synagogues were closed, homes were confiscated and thousands of Jewish people were either killed or forced to convert to Christianity. A neighborhood of narrow, cobbled alleys and streets, the barrio is filled with orange trees, colorfully tiled patios and small-scale plazas as well as a wide array of tapas bars and restaurants. Closed to vehicle traffic, the neighborhood is perfect for visitors who want to experience the ambience of a medieval Spanish city. In 1914, Sevillian architect Anibal Gonzalez began designing a series of buildings in preparation for the upcoming 1929 Ibero-American Exhibition. Located near the Santa Cruz neighborhood in the Parque de María Luisa, the building were constructed for the world’s fair to showcase Spain’s role in history, industry and technology. Among the exhibits housed in the main edifice were manuscripts written by Spanish explorers Columbus and Cortes. The buildings are a rare example of the Regionalist Revival style of architecture, which is characterized by a use of local materials. Today, the structures serve as government offices. Located next to the Plaza de Pilatos, the Caso de Pilatos is considered a premier example of an Andalusian palace. Designed by architect Genoese Antonio Maria Aprile in 1529, the “Pilate’s House” was so named in reference to the original owner’s son, Fadrique Enriquez de Rivera, who made a pilgrimage to Jerusalem in 1519. Although the building is privately owned by the Medinaceli family, it’s open to the public for guided tours much of the year. Standout features include a series of bullfight paintings by Francisco Goya, a 16th-century marble gate and a grand staircase ornamented with a Mudéjar-style honeycomb ceiling. For visitors who are interested in the Spanish tradition of bullfighting, the Plaza de Toros de la Maestranza is a can’t-miss destination. The oldest bullring in Spain, the 14,000-seat arena dates back to 1758, and bullfights are still held here on Sundays from spring to fall. Visitors don’t need to watch a bullfight, however, to learn more about the tradition. The adjacent museum exhibits artifacts and information about famous bulls and matadors. Tickets include admission to the museum and a guided tour of the ring. Located at La Encarnacion square in Seville’s Old City district, the newly completed Metropol Parasol is described as the largest wooden structure in the world. Designed by German architect Jurgen Mayer-Hermann, the building features six gigantic umbrella-shaped structures made of birch wood imported from Finland. Nicknamed Las Setas de la Encarnacion, or Incarnacion’s Mushrooms, the modern design has spurred almost as much controversy as the building’s exorbitant price tag. Delays and changes in building methods doubled the estimated cost of 50 million euros. The structure is home to a marketplace, an antiquarium, a restaurant and an open air plaza. Seville’s primary public park, the Parque de María Luisa stretches along the Guadalquivir River near the center of the city. Most of the park’s grounds were originally part of the gardens of the Palace of San Telmo and were donated to the city in 1893. Landscape designer Jean-Claude Nicolas Forestier is responsible for the park’s present configuration. The park is known for its large population of birds, which include doves, swans, parrots and ducks. Statues, ponds and fountains scattered throughout the park make it a picturesque and pleasant spot in which to relax in the Spanish sun.